This kit came as quite a surprise to me. 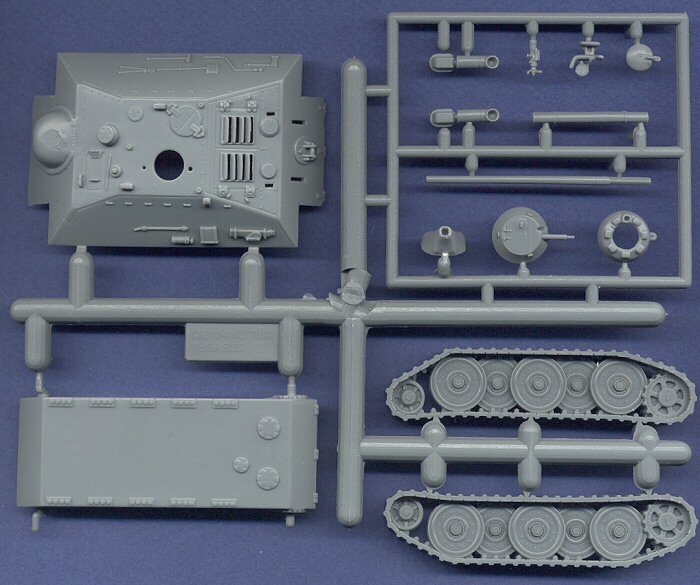 Not only is it an unusual choice of subject, but it is not of the same line of kits that Pegasus started with their Maus kit, released earlier this year. 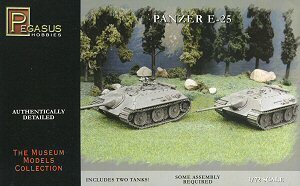 Specifically, this E-25 kit is designed with wargamers in mind. The box contains two complete, identical models. As you can see in the scan, the kits are very simplified, meant to be easily and quickly assembled. There are 14 parts on each sprue, of which between 10 and 13 parts are used, depending on which version you wish to build. Parts are included for a machinegun turret/cupola, or a normal periscope-equiped cupola with rotating hatch and infra-red night-vision equipment. For those of you who have bought and/or built the wargaming kits from HäT, you will know what to expect here, except for the fact that these Pegasus kits are done to a higher standard than the HäT kits. Details are more sharply executed, and the kit is simply more crisp and cleanly molded. Some downsides to this kit are the closed crew hatches (except for the commander's cupola), and the very poorly detailed tracks. As typical with kits like this, the tracks are not able to be detailed because of the way they are molded, and consequently lack any sort of internal or external detail. The tools that are molded onto the hull sides are also poorly molded, but it is questionable as to whether or not they are even located in the correct places. Judging the accuracy of a vehicle like this is difficult, considering the fact that none of these were ever built, and it was only an experimental design. However, based upon 1/35th scale kits that I have seen, it would appear that the exhaust pipes are incorrectly designed, and the pioneer tools are not located correctly (they should be on the hull rear, with spare track links and tow cables located on the hull sides). But again, who's to say what is "correct" for a vehicle like this. Even though Pegasus' item # for this kit is 7602, the box states that the kit is 1/72nd scale, not 1/76th (though I've no references to confirm that). Simple but adequate instructions are included in the box, but there are no decals. This is a very cute little model, which although is overly-simplified, can be turned into a really nice replica if some extra work is placed into replacing and correcting the tracks and other details. Thank you very much to Ken Overby for providing the review sample.